Your values, your beliefs and everything you believe to be true about yourself. Why is aligning your body gain goal absolutely vital? More-so the beliefs you entertain which lead to the thoughts you have which lead to the decisions you make which lead to (eventually and often subconsciously) the actions you take. Once your body gain goal and your values and beliefs… most importantly YOUR IDENTITY BELIEFS are in alignment, taking the actions that will get you awesome results becomes easy. 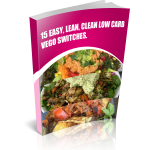 It’s the only sustainable, enjoyable and non-exhausting way to get your ideal body and to keep it. Let’s take a step back. The weight loss-fat loss-BODY-GAIN roller-coaster is exhausting right? It’s frustrating and disheartening. A constant will-power battle is completely unsustainable. To fight yourself is to focus on deprivation with your food and punishment with your exercise. To be proud of a skipped meal or a day of meal replacement shakes and then spiral into and all-out-fake-food-binge-fest AND then to waste the energy you don’t have enough of anyway (because of that ZERO-quality food you’ve been feeding your body!) on guilt and self-loathing. When I first made a habit of regularly getting to the gym I hadn’t taken the time to align my goal with anything. I was likely just subscribing to ‘society’s ideal’ and wanting to look like one of those super-lean-yet-toned-chicks. Fairly UN-compelling right? As a result, I’d do the time, sweating out 2 hours a day at the gym and I looked ok however I never managed to achieve the consistency with my food that would allow me to really achieve my goal. I’d fall for the energy in v. energy out trap. You know, when you binge on say an entire box of Crunch Nut Cornflakes… (that was my Go 2 break-up remedy in my early 20’s…and there were a few break-ups to be eaten my way through!) …and then hit the gym for death by excruciatingly boring cardio machines for a couple of hours. AND then, drag yourself back to the couch with… some more cereal or ice-cream or chocolate…. it’s a vicIous cycle. How to Align Your Winning Body Gain Goal. Your VALUES are those emotional states or qualities you value before anything else – they determine all of your decision making and therefore your destiny. What has been of most importance in your life? Not the emotional states you would like to think are your priority – the emotions that have until now been those you have sought out. Take as long as you need to make a thorough list and then reduce it to just 5-7 values. Now order these top values; place them in a sentence to test how you feel about them – for example ‘What in my life has been more important to me ‘Health’ or ‘Family’? Once you have you top values in order it will become clear why you find it so easy to excel in some areas and not in others. Love Freedom Security Safety Health Passion Vitality Adventure Honesty Integrity Respect Growth Wisdom Gratitude Generosity Playfulness Uniqueness Creativity Happiness Contribution Intelligence Connection Compassion Friendship Trust Fun. The beliefs you have about yourself also guide the decisions you make. So far as achieving your health goal, they can be a massive ally or a ball and chain around your ankle. This is a congruency check where you check in to ensure that the achievement of your specific body gain goal can compliment your best version of you and your ideal lifestyle. Next. Clarify in what ways these beliefs are serving you and also in what ways they are limiting you (for now just in relation to your health goal to keep it simple). Finally. In the situations where you’ve created rules or habits to support your identity belief that are in conflict with the actions you need to take to achieve your health goal… MAKE UP NEW RULES and create new habits! For example: the NON-natural exerciser may be subscribing to the rule: an impromptu weekend walk means you get to skip a scheduled work-out. Conversely the person who always follows through on their commitments to them-self is going to walk to work as scheduled come rain – shine – late night – or slight sniffle. No excuses! 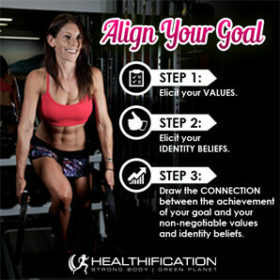 Step 3: Draw the connection between the achievement of your body gain goal and your most compelling values AND your non-negotiable identity beliefs. Caveat a) With this part of the process all you’re looking for is what works. Not scientifically proven stats. It’s basically playing mind games with yourself – for your benefit. So, using myself to illustrate, if my #1 value is ‘Freedom’ and I believe I am a person of Integrity then I can choose to believe that being fit and healthy, being able to wear whatever I like, having the energy for everything that is most important to me – IS FREEDOM. Also that as I am person committed to helping other achieve their best health and their best bodies then to demonstrate INTEGRITY I absolutely have to walk the talk. Those beliefs are going to get me that result I want. It takes away the decision making process because when push comes to shove there is way too much pain involved for me even thinking about being trapped in a body I’m not happy with. Also I hate hypocrites. When I introduce myself as a personal trainer and people give me the obvious up and down look – as they do, every. single. time. – I would be mortified if I didn’t see the “yeah, you pass” look on their face. Again, this is a belief that lets me keep the results I want – it really doesn’t matter if it’s right or wrong, just if it works. Caveat b) Make it easy for you to succeed. So you’ve aligned your #1 Value of ‘Love’ with the attainment of your body gain goal and it also sits congruently with your Identity Belief that ‘I am a loving parent who puts my kids first’. This example could be aligned in any way, as long as it resonates with you. For the purpose of this exercise let’s say you see your ability to be a fit, healthy role model with the energy to spend quality time with your kids and the knowledge to share with them the benefits of real food and regular exercise as limitless fuel to incentivise you to achieve and maintain your body gain goal. Making it easy for you means: real food like: One Ingredient Fat Fighting Food is what you feed your kids 80% of the time. Organic, vegan, raw 100% of the time is setting yourself up to fail. Making it easy for you means: fit and healthy is fitting into your fav jeans and jogging around the park. It’s not run-way skinny or a marathon a week. It’s action taking time. To get actionable today I have 3 steps for you. First to elicit your Values. Second, to elicit your Identity Beliefs and create rules/habits to support the actions you need to take to achieve your body gain goal. Thirdly, to draw the connection between GOAL:VALUES:BELIEFS that will make those habits easy and sustainable. In next weeks #255 show I’ll cover part 3… Smart Simple Fat Loss: Eliminate Limiting Beliefs. That’s it for this week in Healthification… the week we hit 250 shows!!! Huge thanks to you for your support. I appreciate it.